It’s been absolutely perfect here in sunny San Diego. The last few days have felt like summer! One thing is for sure, the season is changing…flowers are blooming, days are longer & nights are warmer! Yay! Where the root veggies & winter squash once filled the tables, the booths at the farmers’ market today were abundant with succulent strawberries & juicy heirloom tomatoes. I’ve got the windows open & a t-shirt on, so why on Earth am I making a salad that screams: FALL/WINTER??? Well, technically it is still winter, at least for another week or so & I have been heavily supplied with pumpkin & winter squash by the CSA this season. The great thing about pumpkin? It keeps forever! The downside? I am stuck at the end of the season scrambling to finish them up! Needless to say, it want to make use of what I have while it’s still in season! I received a beautiful bunch of arugula in my CSA share today. I absolutely love arugula, so decided to make a nice salad for dinner. Did a little search for inspiration & stumbled across this recipe. Bingo! Let’s get that pumpkin in the oven! On a baking sheet spread out cubed pumpkin. 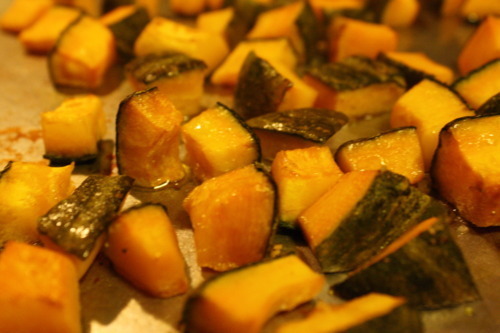 Lightly drizzle pumpkin with olive oil & a couple of pinches of sea salt. Roast for 15 minutes. Once done, turn oven off & keep pumpkin inside for another 10 minutes while you prep the rest of the salad. 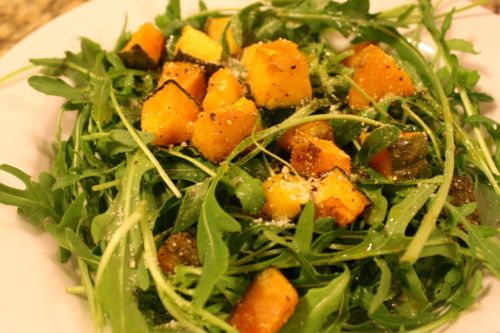 In a medium bowl, toss freshly rinsed arugula & add the roasted pumpkin. Lightly drizzle a little olive oil & champagne vinegar over the salad (1-2 tablespoons of each). Season with vegan parm & black pepper. Give it a light toss & serve. I love the contrast of the crisp, peppery arugula with the tender, sweet roasted pumpkin, & the salty bite of the vegan parmesan! This was nice & simple, but there are so many other possibilities that would make this even more exciting: shaved fennel, toasted walnuts, dried cranberries, etc!